When it comes to supplements I'm probably the worst when it comes to consistency. I end up doing a ton of research on something, get super excited to work it into my routine and a few weeks later I forget to take it for a few days and it makes its way onto the list of supplements I just didn't stick with. If I'm being completely honest I thought collagen peptides would be the same way which is why it took me so long to bite the bullet and spend the money, but after 6 months it's become a part of my daily routine and I've since repurchased multiple times. I originally wanted to try collagen peptides because it supports healthy skin, hair and nails and while those benefits alone are great, I've kept it as a part of my routine because I've noticed a major difference in my joint pain and digestive health as well. When I consistently take collagen peptides, my hair and nails grow extremely fast and while I've never had any major skin issues I can't help but notice that something about my skin just looks better when I look in the mirror. I've also noticed that my chronic shoulder pain (from an old injury) is nearly gone. The only time it still bothers me is when I do a workout where I'm supporting a lot of my weight on my arms. 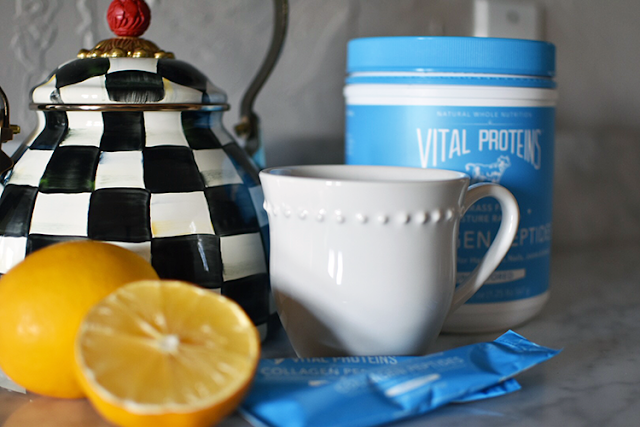 Although there are a lot of brands out there, I take the Collagen Peptides from Vital Proteins. I specifically buy the one with the blue lid (the one I previously linked) as it will dissolve in hot or cold liquids. Some variations of their product will only dissolve in hot liquids so make sure you are reading the description before you buy! A major bonus of this brand is that it's on Amazon and available for Prime delivery which is how I buy mine when I run out. They also sell individual packets which are great for traveling and leaving in your bag in case you forget one morning! There are so many different ways to incorporate this into your daily routine, but what I have found that works best for me is to put one scoop (it comes with one) either directly into my coffee or into a cup of hot water with half a lemon squeezed in every morning. When I'm at home for most of the morning I opt for the lemon water and if I'm in a rush I just put it in my coffee and take it with me. The serving suggestion is up to two scoops per day, but as it is a little expensive and I am currently seeing results, I stick with just one scoop! 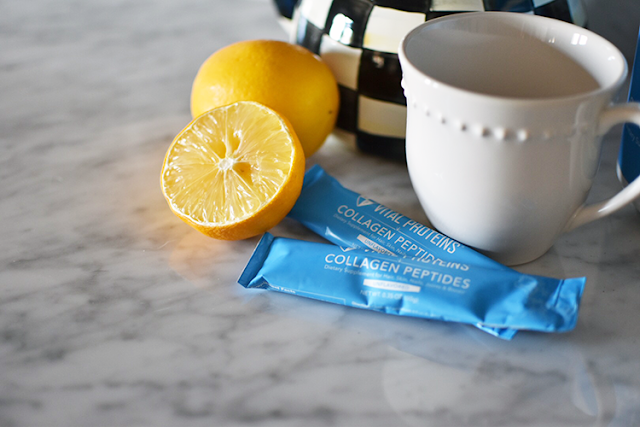 Some people say they can definitely taste the collagen peptides (it is supposed to be flavorless) but I honestly can't tell too much of a taste difference when I put it in coffee or lemon water. I have tried it in just water and it does have a bit of a taste then, so you really just have to find what works best for you! On their website they also recommend trying it in soups, broths and smoothies which is another option if you're not a coffee drinker and don't like lemon water! In my opinion the only downsides are the cost, that it is not completely tasteless in everything and it is something that I have to remember to take daily. But at the end of the day none of these reasons are deal breakers for me! 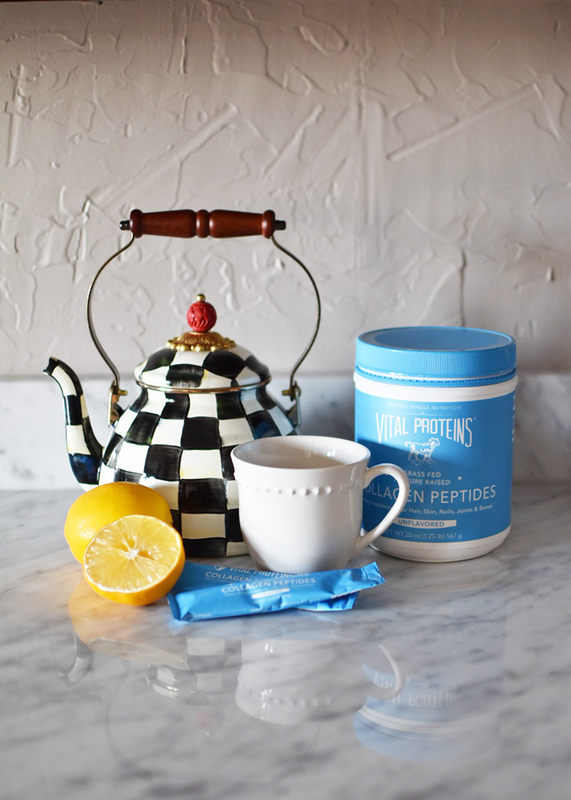 So I'm curious, have you tried collagen peptides?